To renew a health card online, people in Ontario need: a valid driver’s licence to verify identity as a security measure; to have lived at the same address at least 90 days prior to renewing; and to keep all other personal details the same. Individuals can still choose to renew their health card in-person at nearly 300 Service Ontario Centres located across Ontario. The Service Ontario Centre in Picton is located at 1 Pitt Street in Picton (the Courthouse). It’s open from 8:30am to 5 p.m. Monday to Friday. There is no fee to renew a health card. Regular fees apply to renew a driver’s licence, and are the same both online and in-person. If your identity cannot be verified online, the government states that you will need to renew your health card in-person. If you need a photo for your health card or driver’s licence, renewing both at the same time in-person will improve your chances of being able to renew both online the next time around. A free talk will be followed by a tour of the police detachment. Refreshments will be served. Pre-registration is required as space is limited. The event will be held on Tuesday, May 15 from 10 a.m. until noon at the Prince Edward OPP detachment, 569 County Rd. 1. There is limited parking at this location and seniors are encouraged to use the free transportation that is available. For information, to register, or to arrange for the free transportation call 613-476-7493. Community Care is partnering with the Prince Edward OPP to make this event available to seniors. This presentation is part of a project funded by the Retired Teachers of Ontario Foundation. Enjoy a scrumptious meal on Wednesday, May 16 at noon with homemade soup, bangers and mashed potatoes, coleslaw, vegetables, carrot cake, bread and butter, coffee and tea all catered by Bill Grieve, the chef with Wheel House and Occasions Catering. Also there will be a presentation by Warren Powell, Whattam & Hicks Funeral Home, who will speak about being prepared for when a person dies. A question-and-answer session will follow. $10 per person. Reserve by the Tuesday prior at noon, 613-476-7493. Take-out and delivery available. The Prince Edward Family Health Team is offering a free workshop on “Living Well with Chronic Disease” at The Sandbanks Medical Centre in Wellington from May 17 to June 21 from 1:30-4 p.m. Each participant in the workshop receives a copy of the companion book, Living a Healthy Life With Chronic Conditions. For more information or to register e-mail Courses@pefht.com or call 613-476-0400 ext. 214. 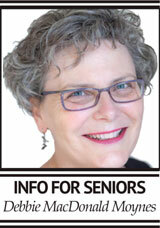 Prince Edward Community Care for Seniors is currently looking for volunteers to visit seniors. To volunteer call 613-476-7493 and start the conversation.